Use a variety of mushrooms in the wild rice stuffing. 3 Can I Cook a Whole Chicken Without Taking the Giblets Out? Fragrant golden brown chicken stuffed with wild rice and mushrooms is the centerpiece of an elegant dining experience. Wild rice, contrary to its name, isn't rice at all but a water grass (Zizania aquatica or Zizania palustris). It is the only grain native to North America, according to the Whole Grains Council. Mushrooms complement the earthiness of the wild rice. Stuff the chicken right before baking. Stuffing the night before can lead to the rice being contaminated. The internal temperature of the cold rice may never get high enough to kill off salmonella or botulism, which could lead to food poisoning. Make the stuffing the night before if you're pressed for time, but don't stuff it in the chicken yet. Or, cook the rice ahead of time and make the stuffing right before assembling the dish. Rinse the rice several times to remove dust and debris. Pick through the rice to remove any small pebbles. Dark pebbles won't stand out against the dark grains of wild rice, like they do with white or even brown rice. Strain the rice and shake to remove excess water. Do not rinse the chicken, advises FoodSafety.gov. Any bacteria is spread to other surfaces. Pat the chicken dry with paper towels for a crisper skin. Throw the towels away immediately. Mushrooms may be wiped clean with a fresh paper towel. Wild rice has to be cooked before stuffing a chicken, or anything else for that matter. The rice expands by absorbing the water or cooking liquid. If you put raw or undercooked rice in the chicken, it won't finish cooking because there isn't enough liquid. 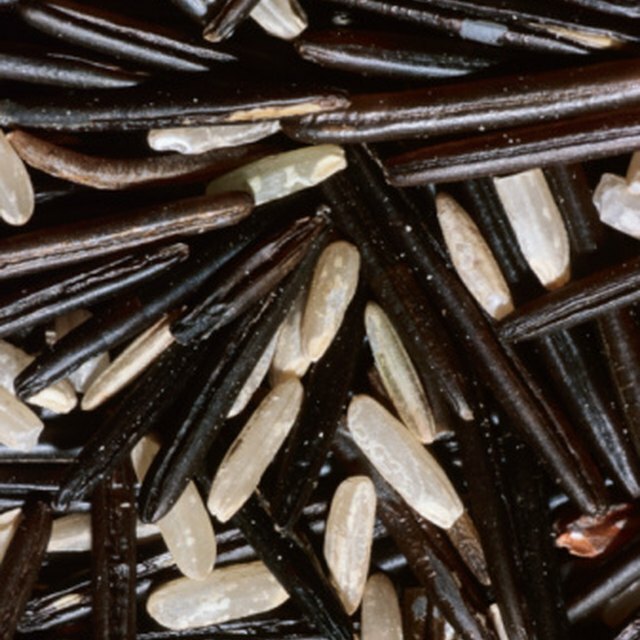 Wild rice takes longer to cook, about 45 minutes, while white rice takes about 20 minutes. The texture is chewier as well. Give the rice a nutty flavor that complements chicken by sautéing in a bit of oil or butter. Add flavor by tossing in a handful of chopped fresh herbs such as tarragon, chervil, rosemary or thyme during the last 5 minutes of cooking time. Add the mushrooms after the rice has cooked, using a variety of mushrooms in the stuffing. Make more rice and mushroom stuffing than is required for chicken, and bake in the same pan as the chicken and serve as a side dish. Stuff a whole chicken if you wish or stuff any part of the chicken. For example, remove the bone from the thigh and leg of the chicken and stuff the remaining space. Stuff a skin on chicken breast still on the bone by making a pocket in the flesh and stuffing the pocket. Roll a boneless chicken breast around the stuffing and bake seam-side down. You may need a toothpick to hold the breast closed. Whatever you stuff the internal temperature of the chicken must reach 165 degrees Fahrenheit, according to FoodSafety.gov. The thermometer should be inserted into the flesh and not the stuffing, nor should it rest against a bone. Does Packaged Chicken Have to Be Washed Before Cooking? Do You Have to Wash Your Hands When You Touch Raw Chicken? Can I Stuff a Chicken the Night Before Cooking?